I have experienced themed dining all over the world. From pirate themed dinner shows to the Magic Castle in California to UFO themed eateries, I love eateries that have their own unique signature style. It’s worth noting that most themed dining is fake. Those aren’t really pirates, you aren’t really in a rainforest and Chucky Cheese is either a robot or a dude in a costume (sorry, kids). On a recent visit to Niagara Falls, I made a special side trip just so I could eat at a new restaurant in downtown Toronto, about an hour-and-a-half away from the Falls. From the moment I heard about Signs, I knew I had to go. 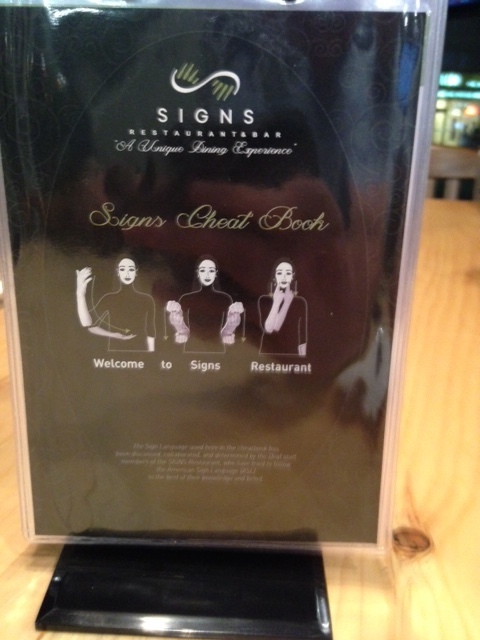 Opened in July 2014, Signs is the only restaurant in North America that centers around the theme of sign language. 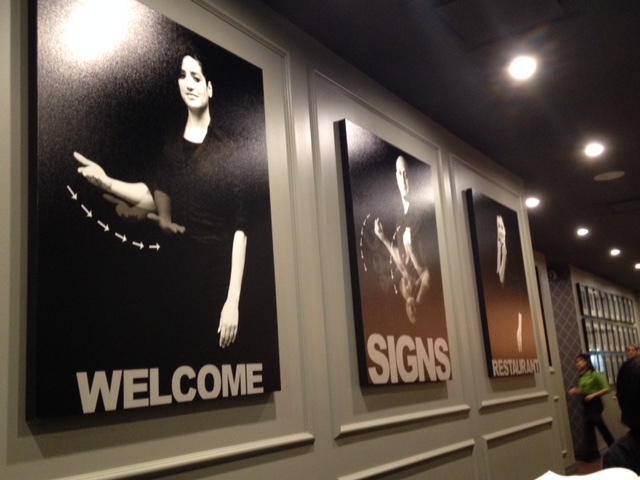 The walls are adorned with pictures of various words and phrases and someone giving you the ASL (American Sign Language) sign for that word. Walk around the dining room and you can learn anything from “hello” to “martini” or the signs for each letter of the alphabet. And you’re gonna need it as everyone in the wait staff is deaf. 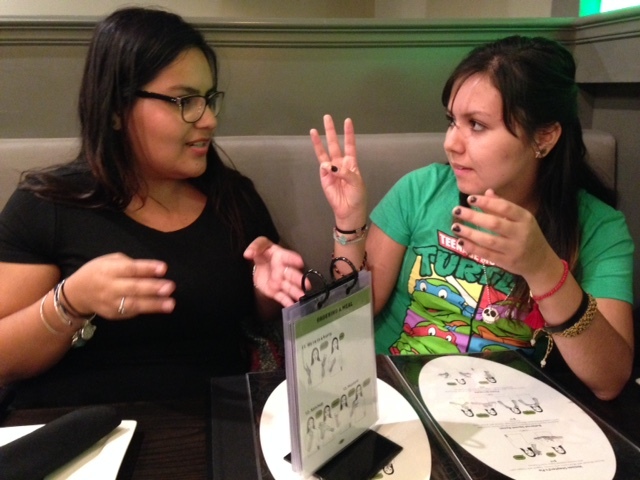 That’s right; the only way to communicate with your server is through sign language. Once at the podium, you are greeted by seaters wearing all black who are not deaf, but are fluent in ASL. 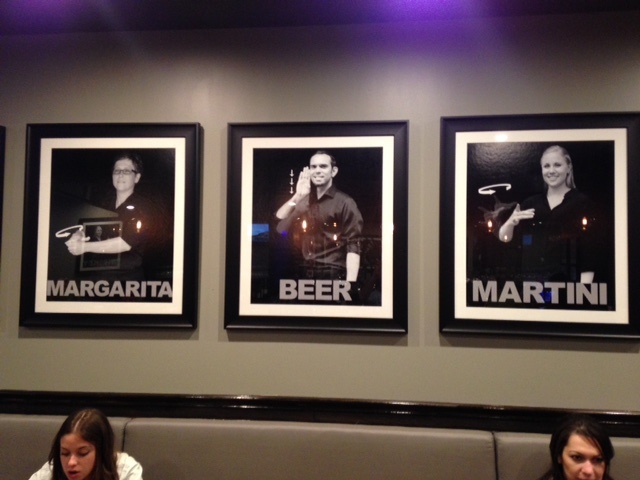 They greet you and send you off to your table. Once seated, they give you a brief introduction and explain that your server (all wearing green shirts) will be communicating with you via sign language because he or she is deaf. 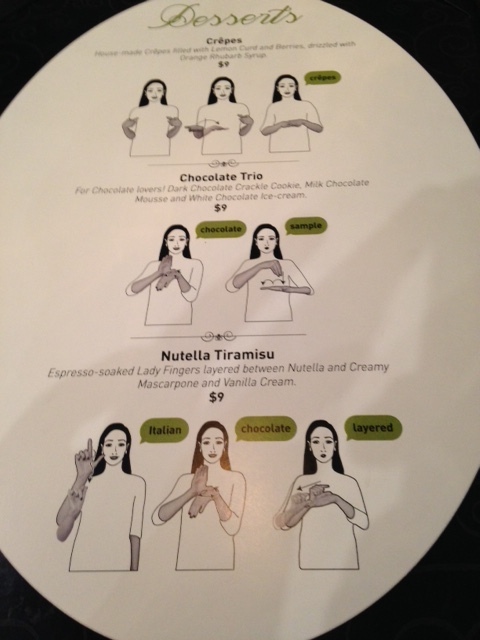 Lucky for those of us, like myself, who are not fluent in ASL, each menu item has a diagram below it on how to sign each word. In addition, there is a table topper “cheat book” that gives extra signs for things that aren’t menu items. If the server asks how your food is, you need to tell them if it’s good or not, right? How about a drink refill? Maybe you have an allergy, you’re a vegetarian, want ketchup or need to split the bill? All of these signs and more are available in the cheat book. Once the interpreter leaves your table, it’s just you and the server left to communicate to each other, unless it’s an extreme circumstance. Also, the servers use iPads to place orders and, if necessary, can type out messages to customers if they need to have a more extended conversation than what the cheat sheet/menu can accommodate. Speaking of cheating, you can certainly point to a menu item to indicate to your server that it’s what you’d like to order, however it’s defeating the purpose. 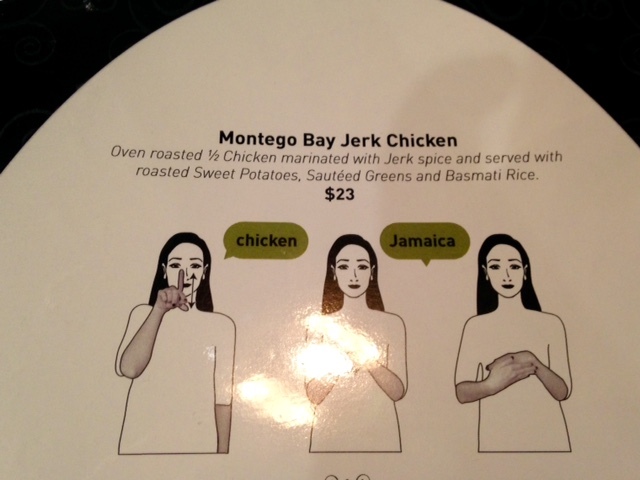 Personally, I ordered a jerk chicken dish and I did my best to give the sign for it, and while I was close, I didn’t get it just right. So my server graciously guided me through what the sign should look like, versus how I probably butchered it on my first attempt. 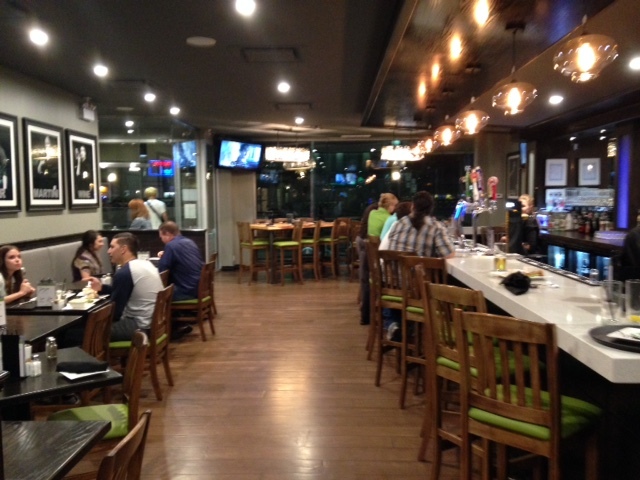 The menu offers a little of everything, from salads to pasta, chicken dishes, and even a fish and steak item. While I wasn’t blown away by the food, it was pretty damn good. Plus, they have a full bar you can order drinks from if you want to skip the food and for me, that was the most fascinating to watch. 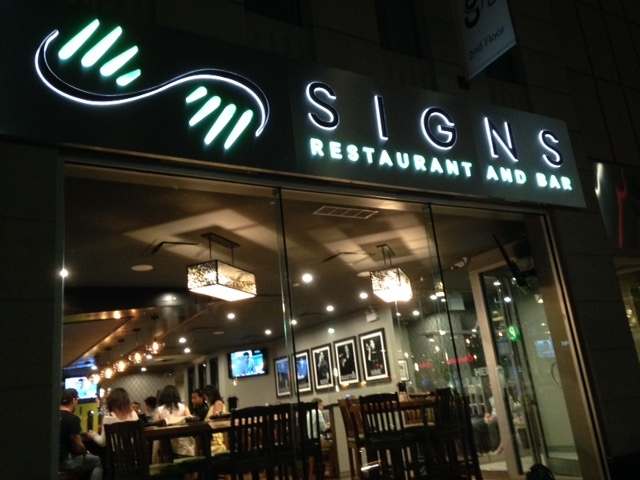 The deaf community in Toronto has completely embraced Signs restaurant. I would say during my visit on a packed Saturday night (I highly recommend reservations in advance), roughly half the people dining there were deaf. Going in, I expected to see a lot of locals and tourists like myself looking for a unique dining experience where you can learn something along the way. 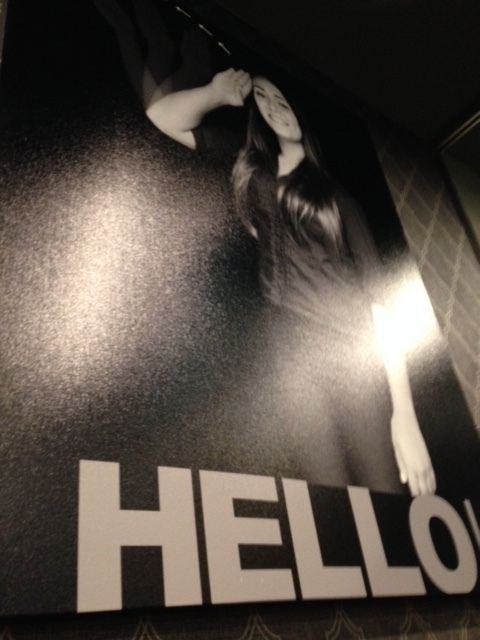 Instead, I saw what seemed to be regulars. 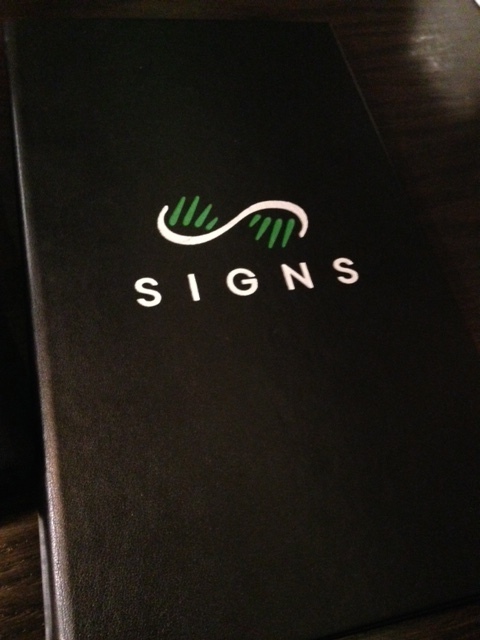 Signs has become a place for members of the deaf community to hang out. After all, how many times can you strike up a conversation at a bar and expect them to know ASL? I can honestly say I have never been in an environment where there are so many people using sign language to communicate with each other, from guests to employees. A restaurant can be a particularly difficult place to work with a lot of ways to drop plates or have accidents. Anyone who has ever been a server can tell you the phrase “behind you” or “corner” can be a life saver and it was fascinating to see how these servers worked around those potential issues. If I lived in Toronto, I would be a regular at Signs. It’s classy, it’s unique and it’s a humbling experience to be in a room where if you’re not deaf or aren’t fluent in ASL, you’re the minority – yet you still fit right in. There is no question that the restaurant is a smash success in Toronto and I would love to see the concept grow and expand into other cities. For more information, visit signsrestaurant.ca and for more stories like this follow Theme Park University on Twitter and like our Facebook Page! This entry was posted in Dinner shows, Outside The Parks and tagged American Sign Language, deaf community, deaf servers, Signs Restaurant, themed dining, Toronto. Bookmark the permalink. Trackbacks are closed, but you can post a comment.